4-Score Backless Contemporary Bar Stool. 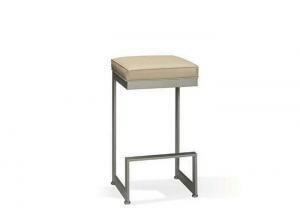 With its unique backless design and artistic base, this bar stool is sure to modernize your space. Available in 26" or 30" seat heights, in a multitude of upholsteries and a myriad of metal finishes, this modern bar stool will certainly meet your design needs. Individually hand-made in the USA, you can be sure these stools will provide years of lasting quality and aesthetic appeal.